The dads in our life deserve no less than the royal treatment for this Father’s Day, and this simple idea will speak volumes of love to that special man in our lives. Give him a present he’ll never forget. Remember that this can be as easy or elaborate as you want to make it. The sky is the limit based on your dad’s personality and preferences. Start with his favorite place to relax: the hammock, a lawn chair or the recliner in the TV room, and build his throne. Then equip it with everything he needs to feel like “King for the Day”. Set up a side table with all his favorite foods and drinks, including a bucket of ice to keep them cold. Use duct tape or clamps to attach an umbrella, a mini fan and a comfortable pillow. 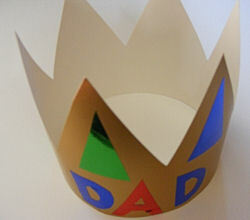 Create a royal crown out of golden yellow construction paper wrapped around his favorite hat and labeled #1 DAD. Make sure the essentials are within reach: remote control, newspaper, fly swatter and a back scratcher. But don’t forget the most important thing of all—a handy bell to ring for service. Every year, take a picture of dad and the kids in the same exact spot. This will make a precious photo for your Father’s Day book, and every year the rest of the family will have fun building a bigger and better throne. Click through for many more Father’s Day tradition ideas, including food ideas, free printable coupon book and more.